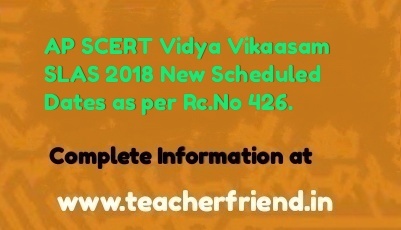 Home» » AP SCERT Vidya Vikaasam SLAS 2018 New Scheduled Dates as per Rc.No 426. AP SCERT Vidya Vikaasam SLAS 2018 New Scheduled Dates as per Rc.No 426. AP SCERT Andhra Pradesh Education Vidya Vikaasam program, State Level Achievement Survey (SLAS) 2017-18 New dates for SLAS examination as per Rc No.. 426 / B / SCERT/ 2017 Dated 18-01-2018/AP SCERT Announced revised timing and schedule of activities conducted from 25-1-2018 to 5-2-2018 for conduct of SLAS Achievement Survay programme in all school Vidya Vikaasam program as per RC.NO:426. Proceedings Rc. No. 426/B/SCERT/2017 dated 22.12.17, on conduct of SLAS in all districts in a set of sample schools. Memo No. 420155/Prog.II/A1/2016, dated 3-2-2017. Attention of all the Regional Joint Directors (RJDSEs), District Education Officers (DE0s), District Project Officers (DPOs( in the state, ref. to 1. and 3. above, State Level Achievement Survey, planned to be conducted from 5-1-2018 to 8-1-2018 was postponed. Accordingly, after due consideration, it has been decided to reschedule and conduct the SLAS examination on the following dates below. The revised timing and schedule of activities for conduct of SLAS are as below. 3 Sealed papers delivered to respective Mandal resource points (under MEO control) 28-01-17 DEOs. 11 DCEB Consolidated packages sent to scanning centers 05-02-17. DCEB All RJDSEs, DEOs and DPOs of the state are requested to take note and ensure the smooth conduct of SLAS activities.